Sun cream is a must in my skincare routine, as my skin burns really easily. 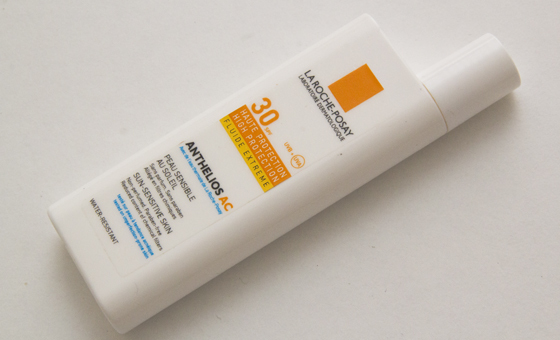 The La Roche Posay Anthelios AC SPF 30 is my favourite sun cream so far. As we didn't have very hot summer in England this year, I thought SPF 30 would be fine for English summer. While being on holiday the temperature was reaching 30-37C on daily basic for 12 days, I still carried on using SPF 30. I normally get freckles around my nose during summer, sun creams help me to protect myslef from that. 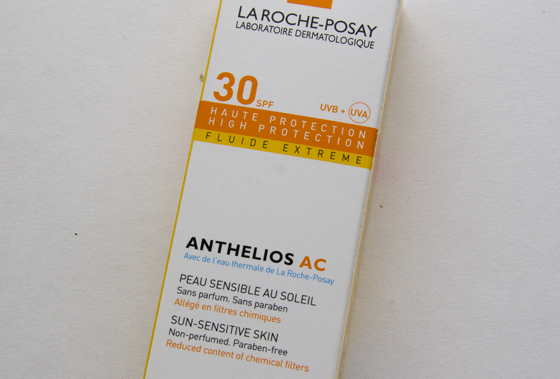 The La Roche Posay Anthelios AC SPF 30 kept me protected, I didn't get any sun burn on my holiday. The products didn't break out my skin, but sometimes it felt too sticky on my skin, mostly when it was very hot! If you planning to wear it alone with out foundation and your skin is oily, you will have shiny patches on your face. I normally use a transparent mattifying powder on my t-zone. One thing that I also noticed that sometimes when you use moisturising cream under the sun cream, everything will roll down your face and you will need to wash it again. It doesn't happened with all face creams. Probably some creams contain an ingredient that won't work with the La Roche Posay sun cream. Overall I do think this is great sun cream, I will defiantly carry on buying it. It is expensive but worth every penny. One more negative that I have to mention, sometimes the smell can put me off, not sure what it is, it's perfume free, but I can still smell something. The packaging is very small, so it will fit into your make-up bag. This is a brand I am keen to try. I try to be as careful as possible when it comes to the sun but find it hard to get a sun cream that does not leave me sticky and shiny though! Sun cream is definitely a necessity in Summer and this is great since the size is quite small and can fit in your bag, which is important too! I'm really big on sun cream, but mainly because I'm so freckly without it haha! but obviously I am still protecting myself from ageing and damage so it's fine!